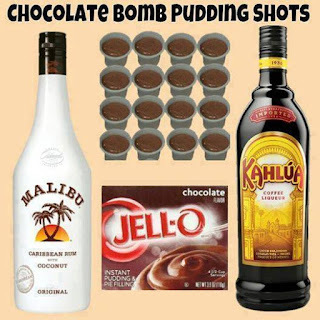 Whisk Kahlua and Instant Pudding together until thick (1-2 minutes). Once it has thickened, add Rum and whisk until all lumps and clumps are gone. Fill almost ¾ of a 1 ounce plastic shot cup with the mixture then cover and place in the freezer. It does take several hours to set. For BEST results, I let them set overnight. Use little ice cream tester spoons when serving them.